Nassau County Legislator Donald MacKenzie attended the recent Grand Opening of Collector Car Showcase in Oyster Bay. Collector Car Showcase, an 18,000-square-foot multi level facility, is packed with antique cars, collector autos, Petroliana, related memorabilia from the early 1900’s thru 1970 and the advertising that promoted this on the silver screen and airwaves. While the facility is a first class museum-like facility that showcases yesteryear, Collector Car Showcase also provides custom detailing, exterior and interior reconditioning services, car storage, hand car washing and window tinting, among other amenities. Collector Car Showcase operates five days a week. Hours of operation and other information may be found at www.collectorcarshowcase.com. 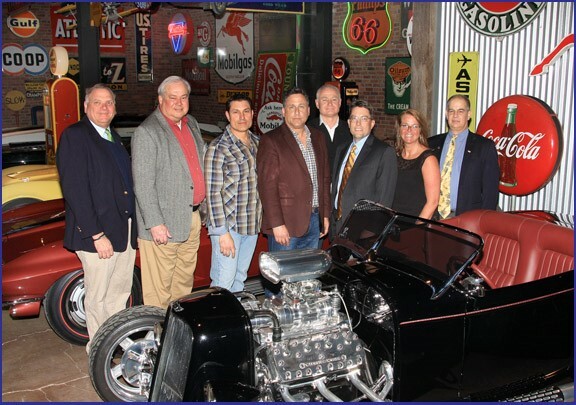 Shown in photo, left to right: Town of Oyster Bay Councilman Anthony Macagnone, Town of Oyster Bay Receiver of Taxes James Stefanich, James Belmonte, David Jacobson and Michael Breen of Collector Car Showcase, Legislator MacKenzie, Oyster Bay/East Norwich Chamber of Commerce President Dottie Simmons and Oyster Bay/East Norwich Chamber of Commerce Vice President Walter Imperatore.